In King Jack, there is a bully, an older brother, a younger cousin and a world of adults that doesn't seem to exist. In what are the essentials for a coming of age story, our titular Jack is forced to deal with each of these things that could very well exist as nothing more than archetypes in a genre that has become flooded by an affinity for nostalgia over the past few summers. What allows these factors to be set apart, or at least find its own voice lies both in the ability of the actors on screen as well as the films knack for striking a perfect tone. There is a distinct aura around first time feature director Felix Thompson's film that gives it a quality of timelessness. Sans a few minor factors, King Jack could essentially take place at any point in time over the last few decades. The problems are the same, the struggle is identifiable and the predicaments are ones you grow accustomed to if you happen to live in a small rural town where the summers get long and often boring. Jack is on the brink. He is in transition from the boy he's always known to the man he will eventually become and because he doesn't know his way around his own mind, because the world is becoming a bigger place more unknown to him than he's ever felt prior it opens up a sliver of vulnerability in the kid who grew up forced to figure things out on his own. 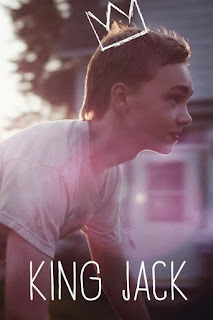 We are introduced to Jack (Charlie Plummer) as he tags a neighbors garage and come to know him all the more through the course of a weekend that sees him not only facing all the aforementioned opponents, but coming to terms with taking responsibility for his actions and ultimately looking out as much for himself as for the few people in his life that he truly cares about. If King Jack were to have a single theme, besides the coming of age pattern, it would be what struck me as the nature aspect of the raising with which Jack and the majority of his cohorts are subject. Having already mentioned that this balloon of a world that is getting ready to pop is devoid of any real adult supervision, Thompson seems to be making a point to emphasize that Jack and his friends have become who they are by all they know. Again, as I said before, the first thing we see Jack do is tag a neighbors garage door only to next see him be caught with cigarettes by his mother (who is largely absent due to the fact she and her two boys are barely scraping by) only to be up followed by a quick exchange of insults with his older brother, Tom (Christian Madsen). In between these world and character building moments we see the honest virtues of Jack begin to build. The inherent kindness as he scoots a bowl of food just out of reach to a dog in a little further or how he innocently takes pictures of himself without his shirt on in an attempt to impress the girl he likes. Jack goes to summer school, no doubt as a result of more poor decisions he felt were necessary to prove his legitimacy, or maybe due to little more than a lack of motivation. The point is, as we follow Jack on his excursions and as he comes face to face with main antagonist Shane (Danny Flaherty), the angry son of the guys house Jack tagged in the opening, we see Jack make bad decision after bad decision. He can't help but to keep going down this road, because it's the only one he knows, the only one he thinks he's allowed on. Whether you blame it on an absent father, a struggling mother or the older brother who was clearly popular in high school and has resulted in nothing since there is nothing for Jack to look forward to and no (good) example for him to go by. Jack (Charlie Plummer) and cousin Ben (Cory Nichols) get themselves into trouble quick. It's hard to say you don't like Jack though, because from the outset you understand he's just a kid and one who hasn't had many advantages growing-up either. With the title character being one of transition we accept his faults as much as we celebrate his accomplishments. Thompson knows that everything he is saying has been said a million times before, but his goal is clearly to present a new way of looking at it with a few original aspects as far as story is concerned. While his stand-out elements are clearly the cast and tone, Thompson covers his devotion to the idea of documenting the formation of a young man through these elements and by making that representation as brutal and honest as possible. Brutality is a key word given King Jack includes a string of bullying scenes where the violence and the sound design make you both squirm and wince in a way that give you great anticipation for when the blows might stop. While it is tough to watch at certain points the film balances this well by making the moments in which Jack is tested emotionally just as tense. There were scenes, filled with only dialogue, where I could feel the anxiety creeping up on me. It was in these offset moments coupled with the authenticity Thompson strives to produce and the high-reaching theme zeroed in on a particular class and culture that make King Jack not only an enlightening coming of age tale, but one that really works. It is only the icing on the cake that star Plummer and his sidekick Nichols have equally charismatic turns that allow both an edge and an innocence necessary for us to believe these characters could survive in this world and that they develop the character they do despite their world.